Do you not know yourself? 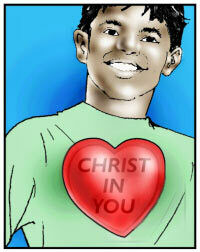 That Jesus Christ is in you? Leave a Comment on Do you not know yourself? That Jesus Christ is in you? And there are numerous other scriptures that confirm this fact, that Christ lives in the believer. But many Christians do not know this, that Christ lives in them; or if they do know it, they only know it in a theological sense and not in a practical, real-world sense. They may acknowledge the truth of this teaching, but it has no play in their everyday lives. Look at what Paul said in our title passage, “Do you not know yourselves…?” Well, do you? The fact is that unless someone teaches you about yourself then you DO NOT know yourself. This is true concerning our spirit, soul, and body. For example, how did you know you had a heart? And how do you know that it pumps your blood? Where you born with that knowledge? No, you were taught it. Maybe you could hear your heartbeat, but certainly you didn’t know what it was and what it did. The same is true with spiritual things. There are many things that you need to know about your spiritual self and that is why we have the bible. One very important thing that we as Christians need to know about ourselves is that Jesus Christ lives in us! God doesn’t come to visit you anymore, He lives in you! He has moved into your heart and made His home there, He has called it His holy temple. Glory to God! My flesh is entwined with my wife, but my spirit with the Lord. We have become one spirit! Amen! This should give you an idea of how much God should be involved in your everyday lives. This should also give us an idea of how much is given to us. When my wife married me she became equal owner to everything I posses (which wasn’t much…). Even so, when we are joined to the Lord we become equal owner to everything He possesses (which is much!). When my wife married me, she knew that she could count on me to protect and provide for her in every way possible. Even so, when we become one with the Lord we know that he will protect us and provide for us in every way. There is only one difference in this comparison. The only difference is that a fleshly relationship is physical and our spiritual relationship is spiritual. And because of that, faith must be used in order to receive physical benefits from a spiritual relationship. Otherwise we will not experience any of the benefits that are promised us. The Church at Corinth had a lot of problems. Two times he asks them the same question: Don’t you know that God lives in you? I think the reason for that is that Paul knew that if the Corinthians could grab a hold of that truth then a lot of their problems would be worked out. The same is true for us today. Grab a hold of the truth that Christ lives on the inside of you. Meditate on that and think about it. I think that it will do you a lot of good. Amen. You shall beat your child with a rod, and deliver his soul from hell. How to: Call down fire from heaven. Previous Entry You shall beat your child with a rod, and deliver his soul from hell.